Oman ( Arabic: عمان‎‎), officially the Sultanate of Oman (Arabic: سلطنة عُمان‎‎), is an Arab country on the south-eastern coast of the Arabian Peninsula. Holding a strategically important position at the mouth of the Persian Gulf, the country is bordered by the United Arab Emirates to the northwest, Saudi Arabia to the west , and Yemen to the southwest, and shares marine borders with Iran and Pakistan. The coast is formed by the Arabian Sea on the southeast and the Gulf of Oman on the northeast. The Madha and Musandam exclaves are surrounded by the UAE on their land borders, with the Strait of Hormuz (which it shares with Iran) and Gulf of Oman forming Musandam’s coastal boundaries. From the late 17th century, the Omani Sultanate was a powerful empire, vying with Portugal and Britain for influence in the Persian Gulf and Indian Ocean. At its peak in the 19th century, Omani influence or control extended across the Strait of Hormuz to modern-day Iran and Pakistan, and as far south as Zanzibar (today part of Tanzania, also former capital).As its power declined in the 20th century, the sultanate came under the influence of the United Kingdom. Historically, Muscat was the principal trading port of the Persian Gulf region. Muscat was also among the most important trading ports of the Indian Ocean. Oman’s official religion is Islam. Oman is an absolute monarchy. The Sultan Qaboos bin Said al Said has been the hereditary leader of the country since 1970.Sultan Qaboos is the longest-serving current ruler in the Middle East, and sixth-longest current reigning monarch in the world. Oman has modest oil reserves, ranking 25th globally. Nevertheless, in 2010 the UNDP ranked Oman as the most improved nation in the world in terms of development during the preceding 40 years. A significant portion of its economy is tourism and trade of fish, dates, and certain agricultural produce. This sets it apart from its neighbours solely oil-dependent economies. Oman is categorized as a high-income economy and ranks as the 74th most peaceful country in the world according to the Global Peace Index. 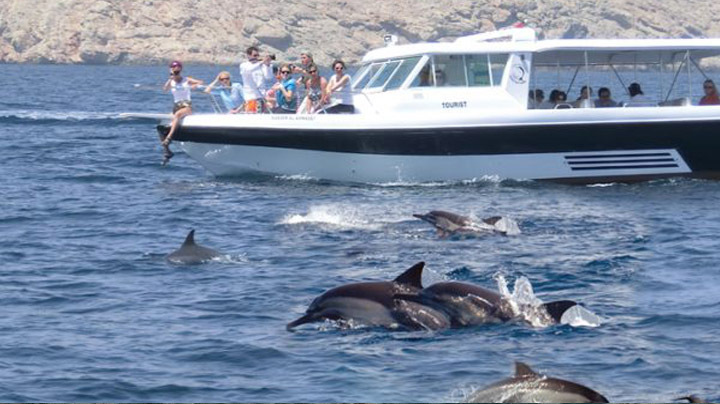 Ahlan Arabia Tours LLC help to plan what could be an adventure of a life time in this stunningly beautiful country of Oman. If you are flying Europe to Asia or vice versa you must stop over. Or if you are visiting the Bright Lights and concrete jungle of Dubai it’s just a short flight or bus ride to Muscat to take in the serenity of Oman’s Natural Beauty. Simply put Oman is the Jewel in the Middle East it is an adventure playground; it has some stunning scenery and a beautiful Ocean just waiting to be explored. And we want to be part of that adventure when Tourism was kicked off only a few years ago, the stated Philosophy was to attract the wealthy Tourists, the ones that stay in lavish hotels and so the theory goes spend more and thus aid the economy. The heat of the summer starts to break in October and really cools off in November it starts to build again in April with the humidity kicking in around the Middle of May. The best time to visit Oman is from October to April. But even in the Height of the summer it is possible to drive high into the mountains and enjoy some wonderful cooler weather. The most important thing you need to know is how to obtain Your Visa. One time Visa Extension allowed from the ROP visa information counter at Muscat International Airport only from 07:30-13:00 SAT-WED excluding Public Holidays or available from the Directorate General of Passport & Residency HQ, Seeb Opposite Muscat International Airport during their working hours. Population: 3,027,959 including 577,293 expatriates (July 2011 est.) Note the population increasing quite rapidly but hopefully not to many “Blokes” . The currency of Oman is the Omani Rial (OMR) divided into 1,000 baisa. Notes come in denominations of 50, 20, 10, 5 and 1 rials, and 500 and 100 baiza. Foreign currency and travellers cheques can be exchanged at banks, exchange bureaus, hotels and at the airport. Outside banking hours, money exchangers operate between 4:00 pm and 7:00 pm in the evenings and at weekends. US Dollars are recommended. American Express, MasterCard and Visa credit cards are readily accepted in large shops and hotels and by an increasing number of traders in the souks. http://www.worldtravels.com Banks such as Bank Muscat, Oman International Bank, Oman Arab Bank, National Bank of Oman and HSBC are available for service from 9:00 am to 2:00 pm and are open from Sunday to Thursday. One OMR is equivalent to 2.58 US dollars and 1.81 Euros. Automated Teller Machines can be found in most major supermarkets, hotels and other locations throughout the country. The cost of living in Oman when compared to that in western countries is similar. Yet, your living expenses will depend on the lifestyle you choose to have. Buying goods that are recognized brand names cost more than the local brands which are usually of comparable good quality and are sometimes even better. The Omani culture has its roots firmly grounded in the Islamic religion. Oman developed its own particular form of Islam called Ibadhism, after its founder, Abdullah ibnIbadh who lived during the 7th Muslims. Omanis are not only tolerant of the beliefs of different Muslim divisions , they are also tolerant towards believers of other faiths, who are allowed to practice their religion in churches and temples. Islam is based on the fulfilment of the Five Pillars of Islam, or the hadiths. By fulfilling these duties, one is assured of a place in heaven.